Monitoring of both surface water and groundwater in the Vale of Pickering has continued over the grant period from April 2017 to March 2018. 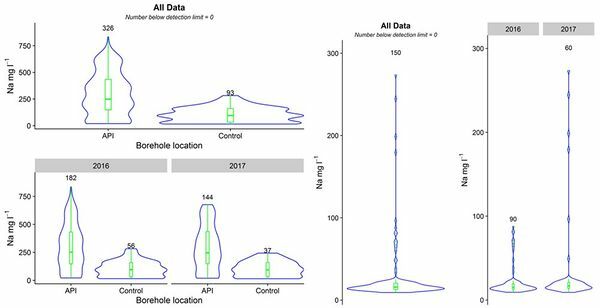 The water monitoring network (Smedley et al., 2015) was initially set up for sampling in September 2015 and augmented with sampling sites provided by new BGS purpose-drilled boreholes from March 2016. We have also been sampling Third Energy’s boreholes at KM8 since April 2016 (Figure 1). New multi-level samplers for groundwater sampling, installed some 2 km east of KM8, have also been monitored frequently since May 2017. Two multi-level samplers have been installed: one with a depth range of 4–20 m (Quaternary extends to depth 7 m) and another with a range of 8–75 m (Kimmeridge Clay extends from 7 m to ca.200 m). The sampler ranges overlap slightly but are designed to sample mainly from the Quaternary and mainly from the Kimmeridge Clay respectively. 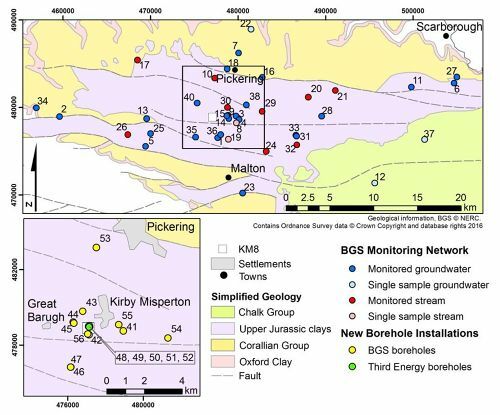 The monitoring network aims to establish baseline chemical characteristics of groundwater and surface water, the former from a Superficial aquifer (Quaternary ± topmost Kimmeridge Clay; depicted as Upper Jurassic clays in Figure 1) and the Corallian Limestone aquifer; the latter from low-order streams dispersed across the Vale of Pickering. The monitoring infrastructure and sampling protocols have been described in detail by Ward et al. (2017). At the time of reporting (March 2018), monitoring of the initial network has been carried out 21 times (with additional samples at other times), the BGS boreholes 21 times, Third Energy Boreholes 20 times and the BGS multi-level samplers 7 times. Frequency of sampling of the network sites and BGS boreholes was initially monthly for 12 months, according to the requirements (for methane) of the 2015 Infrastructure Act. Thereafter, sampling reduced to quarterly, until the point where hydraulic fracturing looked likely to start (October 2017). Monthly sampling was conducted in each from October 2018–January 2018, with a final sampling for the reporting period in March 2018. Laboratory data are here reported mostly up to January 2018. In addition, summary data from the five sondes, installed to collect real-time quality and physical-properties data in the BGS monitoring boreholes, are reported for the period up to March 2018. Figure 1 Water monitoring network for the Vale of Pickering (from Ward et al., 2017). Data for the sites in the monitoring network from the Superficial aquifer are shown in Figure 2–Figure 4. Groundwater pH varies spatially from 7.0–8.8 with broad consistency in values for individual sites over time. Redox potential is dominantly between -200–+200 mV, indicating the mildly to strongly reducing conditions across the Superficial aquifer. 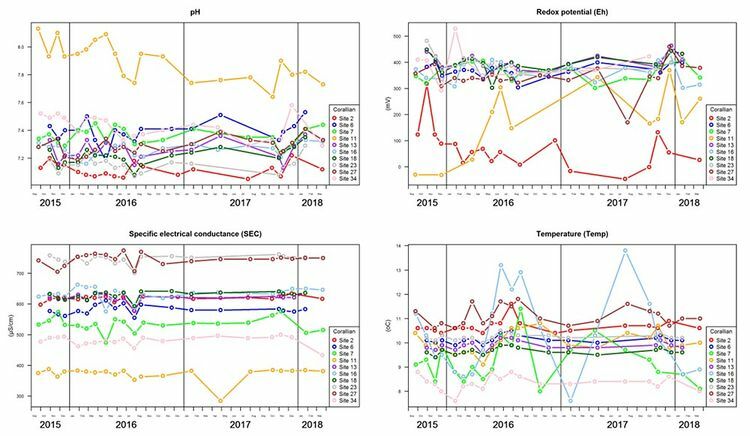 Specific electrical conductance (SEC) shows a large range spatially from 500–3000 µS/cm but with a notable consistency at individual sites over time. Groundwater temperature commonly reflects a dampened response to ambient air temperature but with greatest response tending to be in the shallowest boreholes. In the boreholes with the most extreme temperature fluctuations, some artefact from the sampling procedure is possible, including changes in water level and flow induced by pumping. Figure 2 Physico-chemical parameters monitored in groundwater from the Superficial aquifer. Data for major and minor ions (Figure 3, Figure 4) also indicate a range of compositions in the groundwater from the Superficial aquifer but most have a notable consistency over time. The data confirm the Na-HCO3 dominance of the water types in the aquifer, with reducing conditions supported by high concentrations of dissolved NH4, Fe and Mn in many. By far the largest variability is seen in groundwater sampled from Site 15. This borehole is on a site with numerous nearby boreholes and was disused before being incorporated into the monitoring network. Changes over time could reflect changes induced by pumping of the borehole itself, effects of pumping neighbouring boreholes, or a combination of the two. The borehole was pumped more regularly during February–March 2016, November–December 2016 and January 2017 (pump rates unknown). The changes in water chemistry at Site 15 over time imply some stratification of water with depth, with draw-in from different horizons depending on local pumping rates and regime. These observations highlight the care required in designing/selecting and operating groundwater monitoring points. It also illustrates the need for multiple monitoring points to ensure that results are representative of groundwater quality in the area and that future changes that might arise from shale gas site operations can be detected. Concentrations of dissolved CH4 are repeatedly high in groundwater from many of the boreholes (Figure 4), several exceeding 1 mg/L and two showing groundwater with consistently greater than 5 mg/L and maxima to 50 mg/L, albeit with substantial variation between sampling visits. Data for dissolved CO2 show a strong inverse relationship with CH4 in Site 15 (Figure 4), suggesting varying redox status over time, in further response to changing pumping rates and inflow horizons. In combination with observations for the major/minor this site is displaying very unusual behaviour, when compared to other nearby sites. This will be investigated further and the outcomes used to inform future site selection, operation and sampling guidance. Figure 3 Data for selected major ions and ammonium in groundwater from the Superficial aquifer. Data for groundwater from the new BGS boreholes in the Superficial aquifer (Figure 5–Figure 7) show similar features to the pre-existing boreholes, with Na-HCO3 dominance, pH varying from 6.5–8.5, Eh -100 to +200 mV, SEC 1000–3500 µS/cm, and temperature varying seasonally. The data show a greater temporal variability but still with broad consistency in chemical composition. This reflects the greater number of monitoring points and data now available. Groundwater in the BGS boreholes is reducing with respect to Fe, Mn, NH4 and CH4, and CH4 concentrations reach up to 40 mg/L in line with values observed in the Superficial aquifer groundwater monitoring network. Figure 4 Data for selected minor ions and dissolved gases in groundwater from the Superficial aquifer. Figure 5 Physico-chemical parameters in groundwater from the BGS boreholes in the Superficial aquifer. Figure 6 Major ions and ammonium in groundwater from BGS boreholes in the Superficial aquifer. Figure 7 Minor ions and dissolved gases in groundwater from BGS boreholes in the Superficial aquifer. Groundwater in the Corallian Limestone aquifer from the margins of the Vale of Pickering (Figure 1) contrasts with that from the Superficial clay-dominated aquifer, being of Ca-HCO3 composition, with a pH range of 7.2–8.0, Eh from 0–500 mV reflecting a large range of redox conditions from oxic to anoxic, and SEC values of 300–750 µS/cm (lower than in the Superficial aquifer). Temperature is mainly in the 10–11°C range, although temperatures for Sites 7 and 16 are more variable (Figure 8). Redox-sensitive minor-element concentrations reflect the range of redox conditions, with some showing high Fe and Mn concentrations and NH4 usually <0.2 mg/L but reaching up to 0.5 mg/L (Figure 9, Figure 10). These very occasional peaks may reflect incomplete purging of boreholes before sampling. 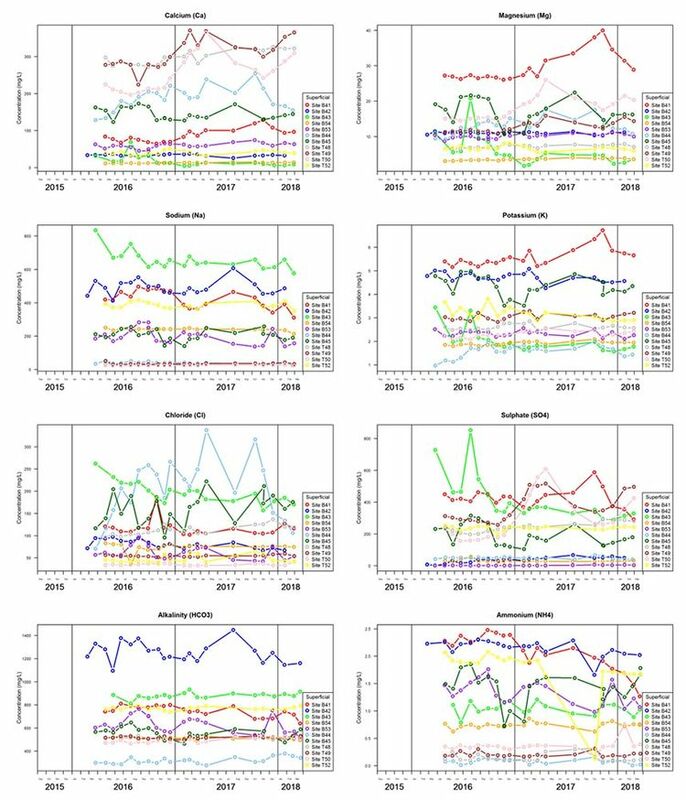 Trends in CH4 concentration over time are spiky, but with much lower concentrations (and range) than observed in the Superficial aquifer (up to 0.7 mg/L in the Corallian; Figure 10). 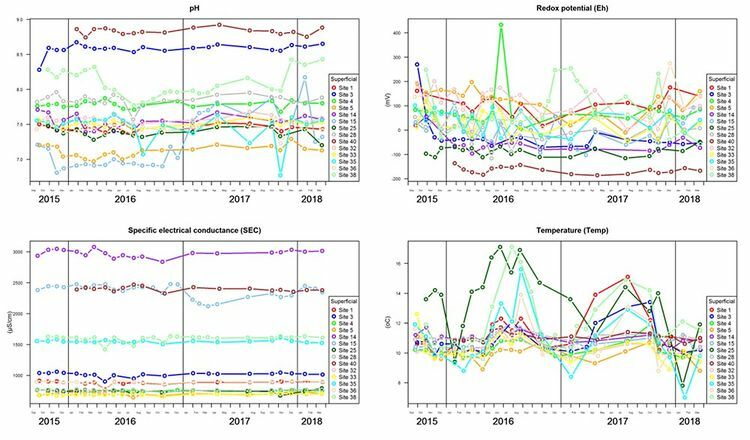 Compositions of many of the solutes in the Corallian groundwater are relatively stable over time compared to observations from the new BGS boreholes in the Superficial aquifer. Figure 8 Variation in physico-chemical compositions of groundwater from the Corallian aquifer around the margins of the Vale of Pickering. Figure 9 Variation in major-ion and NH4 concentrations in groundwater from the Corallian aquifer around the margins of the Vale of Pickering. Figure 10 Variation in minor-ion and dissolved-gas concentrations in groundwater from the Corallian aquifer around the margins of the Vale of Pickering. In the monitored streams, pH values are typically 7.0–8.5 with SEC mainly between 200 and 800 µS/cm and occasionally up to 1400 µS/cm (Figure 11, Figure 8). The stream site with the highest SEC values (Site 29) also periodically has the highest concentrations of Na and Cl as well as the greatest variability in these ions over time (Figure 12). For other major ions and many of the minor ions, compositions are less variable. Occasional spikes in concentrations of Fe may be from material present as a fine colloidal suspension reflecting higher flow rates. Figure 11 Variation in physico-chemical compositions of streams in the Vale of Pickering (Note: redox potential (Eh) only measured for a short period to cross-check electrode performance and confirm oxidising condition). Figure 12 Variation in major-ion and NH4 concentrations in streams from the Vale of Pickering. Figure 13 Variation in minor-ion concentrations in streamwater from the Vale of Pickering. Statistical summary data for selected important analytes in groundwater from the Superficial aquifer and for streams, each collected between September 2015 and January 2018, are provided as violin plots in Figure 14, Figure 15 and Figure 16. These display median, interquartile range and range in the box plots as well as probability density functions (the outer envelope showing relative likelihood of a concentration occurring). The data are divided into: all groundwater data for the period; data in a defined API (‘area of potential impact’, categorised as within an approximate 2 km radius around KM8), control area outside this zone; data for 2016; data for 2017. Data for streams also include all data for the period as well as 2016 and 2017 data. 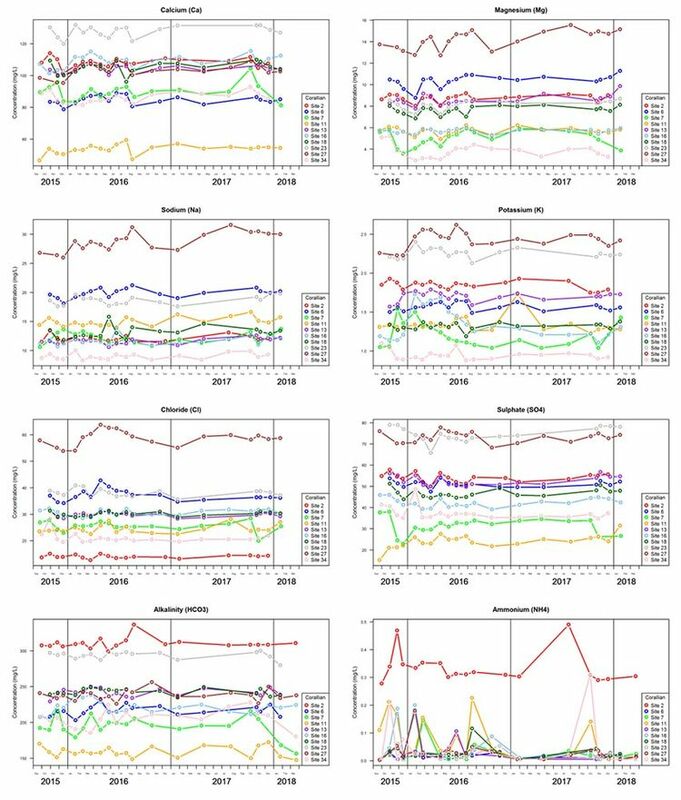 The divisions investigate baseline chemical distributions both spatially and temporally; the time differences have been included to investigate similarities and differences between the distributions for two separate 12-month intervals of monitoring. The summary distributions for groundwater are given in Table 1 and for streams in Table 2. 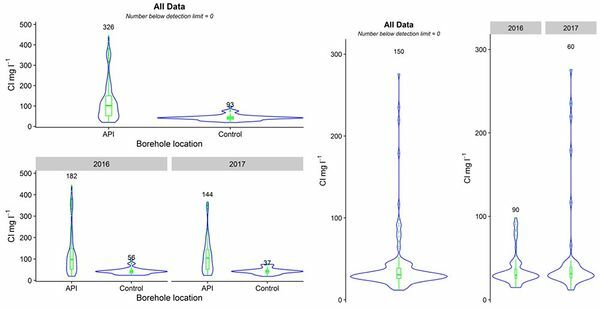 Once a complete baseline dataset is available, the statistics will be re-run and a range of thresholds identified, above which any detection in groundwater will suggest that a deviation from baseline has occurred with an associated level of confidence. 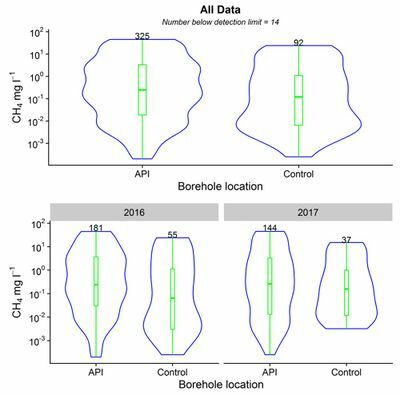 Figure 14 Violin plots (box plots with kernel density estimation) for Na in samples collected between September 2015 and January 2018 left: groundwater; right: streams. API: area of potential impact. Figure 15 Data for Cl for samples collected between September 2015 and January 2018; left: groundwater; right: streams. API: area of potential impact. Figure 16 Data for CH4 for groundwater samples collected between September 2015 and January 2018. API: area of potential impact. Table 1 Statistical summary of groundwater-chemistry data from the Superficial aquifer of the Vale of Pickering. Table 2 Statistical summary data for stream samples collected September 2015 to January 2018. For groundwater from the Superficial aquifer, data from the API and control areas (all dates) have been compared using the non-parametric Wilcoxon signed rank test of significance (Table 3). Statistically significant differences are observed for Na, Cl, SO4, NH4 and Li between the API and control data sets. Significant differences are not observed for Ca, Mg, K, Sr and CH4. For several indicators of salinity therefore, baseline concentrations in the groundwater closer to KM8 (i.e. in the central part of the Vale of Pickering Superficial aquifer) are significantly higher than in the control area (median and maximum values respectively for Na in the API being 248 mg/L/834 mg/L, for control area being 94.3 mg/L/283 mg/L; median and maximum values respectively for Cl in the API being 101 mg/L/444 mg/L, for control area being 41.4 mg/L/97.7 mg/L). It is important to have established this distinction under baseline conditions before considering regional variations in chemistry that may occur under post- baseline (operational) conditions. Table 3 Wilcoxon signed rank test of significance for selected analytes from the API and control areas, Superficial aquifer (S: significant; NS: not significant, 99% confidence level). Table 4 and Table 5 show the comparison of results for 2016 and 2017 data from groundwater in the Superficial aquifer and from streams respectively. For the analytes considered, no statistically significant differences (at 99% confidence level) were observed. From the sample sites and the analytes investigated, there is no indication that significant differences occurred in the water chemistry from the two 12-month intervals of sampling. This suggests that a 12-month period of monthly monitoring ahead of any site operations may be sufficient to characterise the baseline. Table 4 Wilcoxon signed rank test of significance for selected analytes from groundwater in the Superficial aquifer, for the years 2016 and 2017 (NS: not significant, 99% confidence level). for the years 2016 and 2017 (NS: not significant, 99% confidence level). 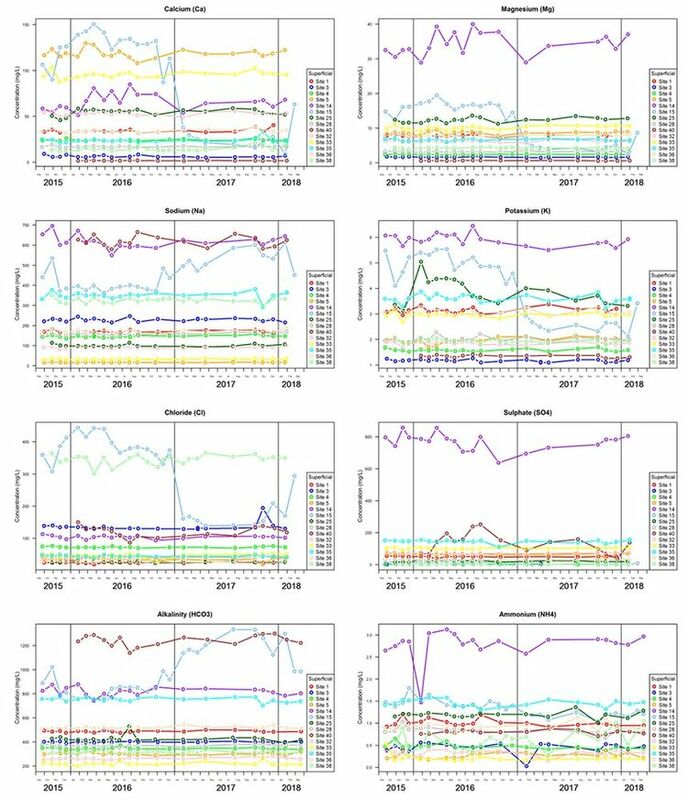 Results for hourly monitoring of groundwater quantity and quality (pH, SEC, temperature and groundwater level) from five sondes over the last year of monitoring (March 2017 to March 2018) are displayed in Figure 17. 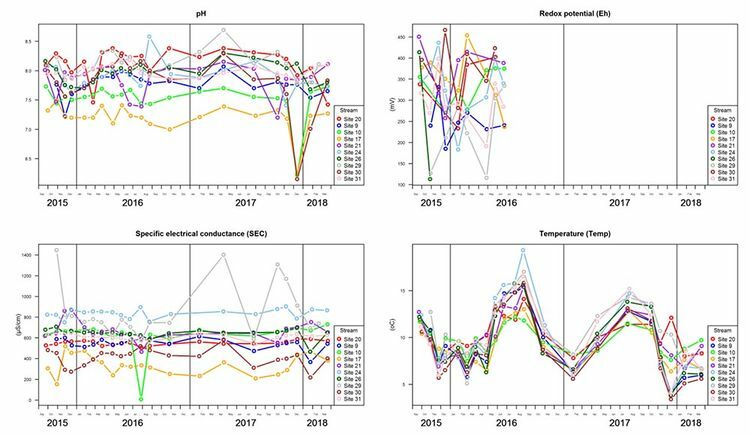 Short-term spikes in the time series indicate intervals when sondes were removed for maintenance or calibration and have been retained in the record to indicate frequency of intervention. We experienced significant problems with EBM8 over the monitored interval despite attempts to rectify. For this sonde, some values for pH, SEC and temperature from September 2017 to March 2018 are spurious. The sonde has since been repaired. 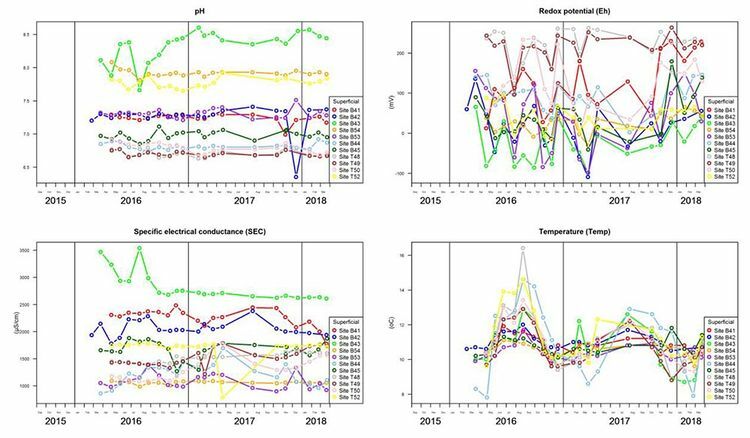 The pH electrode in EBM9 also gave spurious data in early September 2017, since repaired. Other fluctuations over the year are believed to be real variations; pH shows variations typically of 0.5 pH units (up to 1 pH unit), SEC of up to 1000 µS/cm and water level of <1 m (Figure 17). Temperature has been the most stable parameter, varying between 10–11°C for the boreholes observed. Hourly monitoring is continuing. 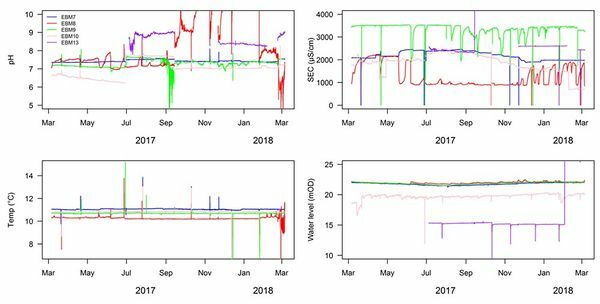 Figure 17 Real-time monitoring data (pH, SEC, temperature and groundwater level) from five sondes within boreholes in the BGS groundwater monitoring network. Figure 18 Comparison of pH and SEC values for groundwater collected during the monitoring rounds with values determined by sondes in real-time (1:1 lines also shown). Figure 18 shows a comparison of pH and SEC values determined during spot sampling in the monitoring rounds from the BGS boreholes (Superficial aquifer) with values determined downhole from the installed sondes at the approximate time of sampling. Values are broadly comparable for each parameter and provide confidence in the data produced. Data for Site BGS 45 (EBM9) are an exception, with both pH and SEC showing systematically higher values in the sonde data than the monitoring samples, albeit only by 0.5 units for pH. Spot sampling involves recording of field readings while pumping until stable values are obtained. In the case of Site BGS 45, on most sampling occasions, SEC values started at around 3500 µS/cm but dropped during the course of monitoring (periods of up to 1 hour). This suggests that low-flow pumping of the borehole over time induces flow with a differing composition from different horizons in the aquifer sediments. This may point to salinity stratification with depth in this borehole, and will be investigated further using depth profiling. Measurements of SEC made during spot sampling are reported after stable readings have been obtained and therefore reflect the lower SEC values. Profiles of groundwater from the two multi-level samplers indicate some notable consistency over the successive sampling rounds between June 2017 and February 2018 (Figure 19). Where depths of the two sampler systems overlap, differences at a given depth are likely in part due to spatial heterogeneity. However, systematic differences in redox status are also apparent, with more oxidising conditions indicated (higher SO4, CO2, lower CH4) in the shallower CMT system and more strongly reducing conditions in the Waterloo MLS system. Low SO4 concentrations in the MLS groundwater, accompanied by a notable sulphide smell, are consistent with dissimilatory SO4 reduction. The strongly reducing conditions in the MLS system are also indicated by high concentrations of CH4 and C2H6 in the groundwater (up to 80 mg/L and 800 µg/L respectively). The simplest explanation is that these hydrocarbons are generated in situ within the Kimmeridge Clay, rather than deriving from extraneous sources. 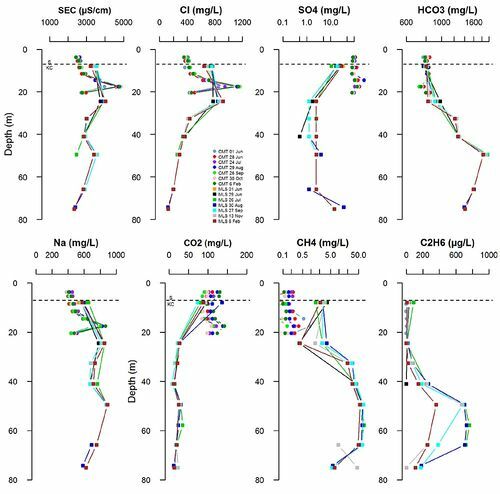 Figure 19 Profiles of selected analytes from a multi-level sampler array sited some 2 km east of KM8; CMT: Solinst Continuous Multichannel Tubing; MLS: Solinst Waterloo multi-level sampler; S: Superficial (Quaternary) aquifer; KC: Kimmeridge Clay. A high-quality groundwater baseline dataset is being compiled. It is providing important insights into the importance of establishing robust information on the conditions before shale gas operations start and also some of the challenges in achieving it. Monthly/quarterly monitoring has shown the greatest consistency in chemical compositions occurring in groundwater from sites in the original monitoring network (both Superficial and Corallian aquifers). Streams also showed a broad consistency over time. Greatest variability was seen in groundwater from the BGS new borehole sites. This suggests that these boreholes, which have only been pumped under low-flow conditions due to the small water yields, may not yet have been flushed and reached a steady state. This is an important finding for future monitoring borehole design and operation. Wilcoxon signed rank tests indicate that for groundwater from the Superficial aquifer, salinity (Na, Cl, SO4) as well as NH4 and Li differ significantly between the aquifer around KM8 (API) and that in the control area. This could be due to differences in e.g. Quaternary lithology (clay representation) and thickness, groundwater flow regimes and redox conditions between the central part of the vale and the more peripheral areas. Comparing statistical summary data for 2016 versus 2017 for groundwater from the Superficial aquifer and for streams showed that sample populations were not significantly different in either case. These statistical distributions will continue to be investigated as more baseline monitoring data become available. Real-time sensor data for five boreholes monitored hourly over the year of reporting show greatest fluctuations for pH and SEC. Although some of the variability has been due to analytical artefacts, underlying fluctuations are likely due to real variability in flow and chemistry within the boreholes. Fluctuations have been greater in EBM8 and EBM9 than the other boreholes. EBM9 in particular is found to vary significantly in its discharge chemistry over a period of pumping. The real-time data are providing a further measure of baseline groundwater chemistry in the Vale of Pickering at times not sampled by the monitoring campaigns and will continue to provide evidence of any material change in water chemistry should the state of monitoring change from baseline to operational conditions. Groundwater data from multi-level samplers installed into both Quaternary and Kimmeridge Clay formations provide much greater spatial resolution on groundwater chemical compositions. Groundwater from the Kimmeridge Clay is strongly reducing (sulphate-reducing and methanogenic). In-situ formation of methane (and ethane) within this shallow formation can explain the high concentrations of these gases observed in the shallow groundwater elsewhere in the Vale of Pickering. ↑ Smedley, P L, Ward, R S, Allen, G, Baptie, B, Daraktchieva, Z, Jones, D G, Jordan, C J, Purvis, R M, and Cigna, F. 2015. Site selection strategy for environmental monitoring in connection with shale-gas exploration, Vale of Pickering, Yorkshire and Fylde, Lancashire. BGS Report, OR/15/067. ↑ Ward, R S, Smedley, P L, Allen, G, Baptie, B J, Daraktchieva, Z, Horleston, A, Jones, D G, Jordan, C J, Lewis, A, Lowry, D, Purvis, R M, Rivett, M O. 2017. Environmental Baseline Monitoring Project. Phase II, final report. BGS Report OR/17/049.